For most classically-trained musicians, performing a world premiere is the exception. But for flutist Paul Taub, it’s the rule. Taub, a Cornish College of the Arts professor and well-known Seattle-area performer, has been a proponent of new music for decades. Over the years, he’s performed and commissioned countless premieres. But last November, he took it a step further. Taub organized a concert of made up exclusively of world premieres by five area composers–Tom Baker, Andy Clausen, David Dossett, Jessika Kenney and Angelique Poteat–and featured a handful of world-class local performers, including Taub himself. The concert was part of the Wayward Music Series at the Good Shepherd Center’s chapel performance space. Second Inversion was there to record the concert and we’re pleased to present the audio! I asked Taub a few questions about the pieces he commissioned, and his answers are below. What inspired you to do a whole concert of world premieres? My musical life—as a student, an educator, member of ensembles, professional organizations, circles of colleagues and friends—has often centered on new works and their creators and interpreters. And my relationships and interactions with composers have been highlights of my career. In my thirty-six years in Seattle, I have participated in hundreds of commissions of new music. This project gave me a chance to create opportunities for five unique composers to write works for me, in a chamber setting. The works you will hear on this program will contribute significantly to the general repertoire for the flute in chamber music. They are also gifts to the Seattle music-loving community, brought together through its interest and support and enjoy­ment of these engaging and inspiring composers. For me, the final gift is to be able to prepare and perform these new works with some of my favorite colleagues – Laura DeLuca, clarinet; Walter Gray, cello; Joe Kaufman, contrabass; Cristina Valdes, piano; and Matthew Kocmieroski, percussion! You’ve heard and performed lots of new music. What do you think makes a new piece really good? That’s a tough question! People have such contrasts in taste, stylistic preference… What one person considers a masterpiece someone else will find trivial, or boring. I consider myself a musical omnivore in terms of style so I can only answer the question more “generally” by saying that what I really, really like is music that grips me both emotionally and intellectually. Somehow the perfect balance between those two elements makes for a great piece. Why did you choose these five composers? [These composers] have been invited to participate in this project because of the high artistic quality of their work, the diversity of their styles, the varied stages of their career trajectories, and above all, because their music truly speaks to me and to the public. The variety of musical styles is a key element of the project. Baker and Kenney are well-established “mid-career” composers, with impressive resumes and works that have been played internationally. Poteat, in her late 20s, is emerging as a significant voice in the Seattle and national music world, with recent pieces commissioned by the Seattle Symphony. Emerging composers Dossett and Clausen (whose band The Westerlies has taken the jazz world by storm), are recent college graduates (Cornish College of the Arts and the Juilliard Jazz Program). The composers’ musical styles are varied and contrasting, with influences as diverse as jazz, electronics, Persian modes, classical music and improvisation. What does the rest of this concert season have in store for you? I’m especially looking forward to a few events. I’ll be playing a solo by Estonian composer Helena Tulve with the Seattle Modern Orchestra on February 20; touring the Northwest with a program of Brazilian flute and piano music with pianist/composer Jovino Santos Neto (Portland, Methow Valley, Seattle and Bellevue) in late February/early March; and taking the lead in a concert of music by Janice Giteck on April 12 at Cornish. This post is part of a series on John Cage’s “Diary: How to Improve the World (You Will Only Make Matters Worse).” For earlier installments of the series, please visit: Introduction, Part I, Part II, Part III, Part IV, and Part V.
Since its invention in the early 18th century, the piano has been the cornerstone of the Western classical music tradition. It has been the conduit for the musical masterpieces of Bach, Beethoven, Chopin, Liszt, Rachmaninoff, and countless other composers. It has been the staple instrument in all studies of Western music theory, the standard instrument for accompanying soloists, and the shimmering star of recital stages around the globe. The depth and breadth of classical piano repertoire is astounding. As an instrument, it has garnered a reputation as one of the most beautiful and most perfect modes of human expression—and John Cage threw a wrench in it. Literally. In 1940 Cage invented the prepared piano: a grand piano that has had its sound altered by placing everyday objects such as screws, bolts, and pieces of rubber on or between the strings. His creation shocked and intrigued audiences around the world. To place everyday objects inside a grand piano seemed almost sacrilegious—or at the very least, iconoclastic. But what he created was a new type of beauty. What he created was an entire percussion orchestra from just a single instrument. And while the notion of a prepared piano may seem unconventional, eccentric, or even extravagant to the Cage critics among us, he actually created this musical contraption in response to a very genuine need: while working as a composer and accompanist at Seattle’s own Cornish College of the Arts, he was commissioned to write music for a dance by Syvilla Fort. Presented with the challenge of writing dance music for a small stage with no room for a percussion group, he simply—well, improvised. Cage wrote extensively for percussion because, as he himself admitted: “I certainly had no feeling for harmony.” And in a way, I guess he didn’t have much feeling for melody either. Perhaps Cage wasn’t a very good musician in the traditional sense—but that’s precisely what enabled him to explore music in new and nontraditional ways. It’s what allowed him to push the boundaries and open new doors to what music could be and how everyone, not just the classically-trained professionals, could be a part of it. Maybe that’s what inspired the colorful collage of different typefaces that constitute the entire diary. The language takes on a physical as well as an aural presence—conveying the music of the words through the visual variances between them. When you stop and think about it, music and syntax are really quite similar: both are about arranging sounds to create pleasant, balanced, or meaningful statements. But these guidelines and rules limit us; they hinder our creativity, make us stiff and boring. After all, it was the infinite possibilities of the unpleasant, the imbalanced, and the unintentional that most inspired Cage. At times, it’s difficult to tell when Cage is awake and when he’s dreaming. Throughout his diary he’ll shift quite abruptly from a serious discussion of technoanarchism to a whimsical analysis of racial politics, then drop off the edge of reality altogether with a humorous story or a surrealist musing. The notion of time as a social construct is yet another interesting notion throughout Cage’s music and philosophical meanderings. Last summer I studied music composition at the Institut de Recherche et Coordination Acoustique/Musique in Paris, and on my first day our guide took us on a tour of the entire institute. The most fascinating room was the anechoic chamber: a room designed to absorb all reflections of sound, allowing for complete and total silence. They’d only let us stay inside a few minutes at a time, since the silence gets to people. Many musicians are eager to separate their art from current events, whether it’s from a desire not to get entangled or a wish to seem timeless. But Paul D. Miller, better known as DJ Spooky, is eager to do the complete opposite. This year, Miller has chosen to ruminate on some of the most wrenching moments in U.S. history, from Abraham Lincoln’s assassination to the rise of the Ku Klux Klan. The composer, multimedia artist, and trip-hop DJ’s latest project takes on an even more controversial topic: the U.S. government’s decision to bomb Hiroshima and Nagasaki, Japan, in 1945, a move that killed 120,000 people and effectively ended World War II. Miller’s work, Peace Symphony, weaves together evocative music, historic recordings, and present-day interviews with eight survivors from that day 70 years ago. Miller’s piece gets its world premiere at Cornish Playhouse this Friday, December 4, at 8pm, where he’ll be joined by musicians from the Nouveau Classical Project. You can buy tickets here for only $20 when you use discount code CORNISH. This week, the music chair of Cornish College of the Arts caught up with DJ Spooky and asked him a few questions about Peace Symphony. You can read the Q & A below. Tom Baker: First of all, how in the world do you find the time for all that you do as a creative artist? And secondly, do you find the time to notice the rhythm of the space between things with what must be an incredibly busy life? ​Paul D. Miller: I would say everyone is feeling that they never have enough time in the 21st century. For me, music, art, and literature are all simply reflections of the same creative impulse. It’s a core issue in the 21st Century. Capitalism forces our attention span to be framed by the huge array of commercial advertising that inundate us. I guess you could say that I use my art and compositions to create more time and space to think about all the issues facing us, and distill it all in one form. Music is the language we all speak. ​TB: This new piece, Peace Symphony, draws on a dramatic and profoundly disturbing time in world history. I know that you were artist-in-residence for Peace Boat (an international non-governmental and non-profit organization that works to promote peace, human rights, equal and sustainable development and respect for the environment). Was that experience an inspiration for this piece? ​PDM: Japan and Germany took radically different routes after World War 2. Japan has an amazing group of peace activists and so does Germany, but Japan has a very different relationship to its collective memory of the war. I wanted to talk about memory with the survivors to see what could be done with their story. It’s a story we Americans never get a chance to actually hear. That’s what this project bears witness to: it has to be about purple to people shared experiences. Anything else is government propaganda. I try make this as much about humanity as possible. ​TB: Your work encompasses so many disparate pathways, though there always seems to be singular vision at play, even in the midst of intertwined collaboration. How do you reconcile these diverse adventures and creative work into an aesthetic focus? ​PDM: Inter-disciplinary art is the legacy of some of my favorite composers – from John Cage on one hand and Nam June Paik on the other. Aesthetics in the 21st century is one of the most complex forces because it encompasses everything about what it means to be a creative person in this Era. DJ culture is a kind of template because it’s always about searching for new ways to reconsider history. That’s what a good mix does. It gives you a good idea of what is possible. 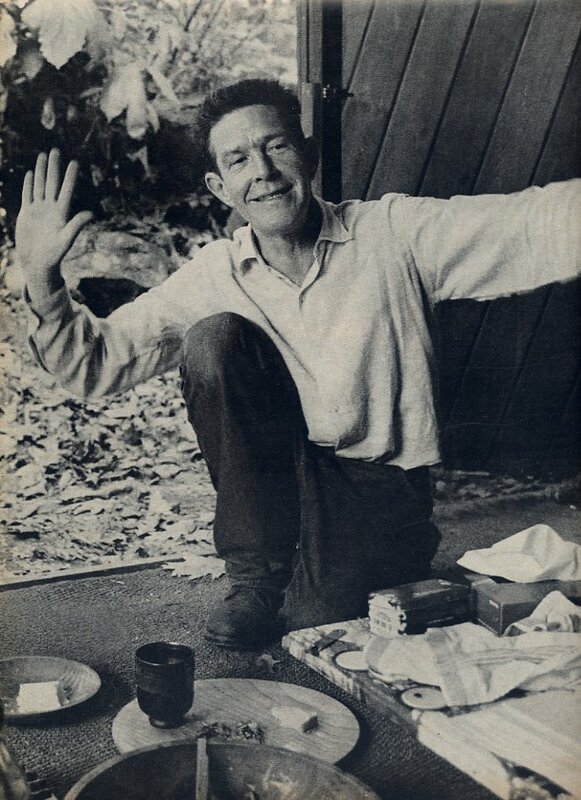 This post is part of a series on John Cage’s “Diary: How to Improve the World (You Will Only Make Matters Worse).” For earlier installments of the series, please visit: Introduction, Part I, Part II, and Part III. To say that the avant-garde composer and iconoclast John Cage was a musical revolutionary would be a bit of an understatement. He was a pioneer of indeterminacy in music, a precursor to contemporary electroacoustic music, an innovator of musical instruments, and, perhaps most controversially, a philosopher of sound and silence. He was much more than just a composer—he was a music theorist, a writer, an artist, and a thinker. He was a learned musician, and not just in the traditional Western sense. His interests extended far past the sphere of Western classical music and into music and art from around the world—particularly East and South Asian cultures. As the title of the piece might suggest, revolution is a key theme throughout his diary—and Cage is not just talking about a musical revolution. The diary addresses social and political issues from across the spectrum, ranging from technology and environmentalism to poverty and violence. And in today’s day and age, those issues ring truer than ever. All whimsical Shakespeare references aside, the truth is saddening, sobering, and impossible to ignore. The all-too-frequent mass shootings, the constant wars, the terrorism—at times it feels as if hostility and violence have taken over our world, transforming our lives into a devastating drama. But when will the curtain finally close on this tragedy? While Cage speaks of revolution almost exclusively in metaphors, analogies, and anecdotes, his optimism is still palpable—buried though it may be beneath his philosophical musings and fragmented memories. He must ultimately have faith in the future—why else would he write a five-hour diary on how to improve the world? “If the situation is hopeless, we have nothing to worry about,” he says softly. In other words, we worry because there is still hope; we worry because we haven’t given up yet. We know that we can still create a healthier, happier, and more peaceful world We can do it through art: through connecting with one another and inspiring one another—through understanding our world as it is, and through working together to make it better. Art is not solely in expressing oneself but in changing oneself—in growing, learning, collaborating with others, and gaining new perspectives. Art exists in creating community. Art is not restricted to the hands that create it but rather, art changes and evolves as it continues to inspire new ideas and interpretations from its audiences. Each viewer will gain something different from a single work of art—and in that regard, the artwork itself opens a wealth of possibilities for the community that views, listens to, and engages with it. When we engage with a piece of art, music, or literature, it sparks new ideas within us—and often even revisiting the same artwork multiple times will create an entirely new constellation of thoughts and emotions. And with advancements in technology, we now have infinite sources of art, knowledge, and inspiration at our fingertips at any given moment. Nowadays, it’s easier than ever to share our creations, collaborate with others, and make music and art accessible for all. All of this technology, all of this music, and all of this art is in our grasp—and we can use it to start a revolution. We can use it as a catalyst for action, and we can use it as a catalyst for positive change. Taub, a Cornish College of the Arts professor and well-known Seattle-area performer, has been a proponent of new music for decades. Over the years, he’s performed and commissioned countless premieres. But this week, he’s taking it a step further. On Friday at 8pm, Taub has organized a concert of made up exclusively of world premieres. The show will feature flute chamber works by five area composers–Tom Baker, Andy Clausen, David Dossett, Jessika Kenney and Angelique Poteat–and will shine a spotlight on a handful of world-class local performers, including Taub himself. The concert is part of the Wayward Music Series at the Good Shepherd Center’s chapel performance space. If you go, bring a $5-$15 suggested donation.